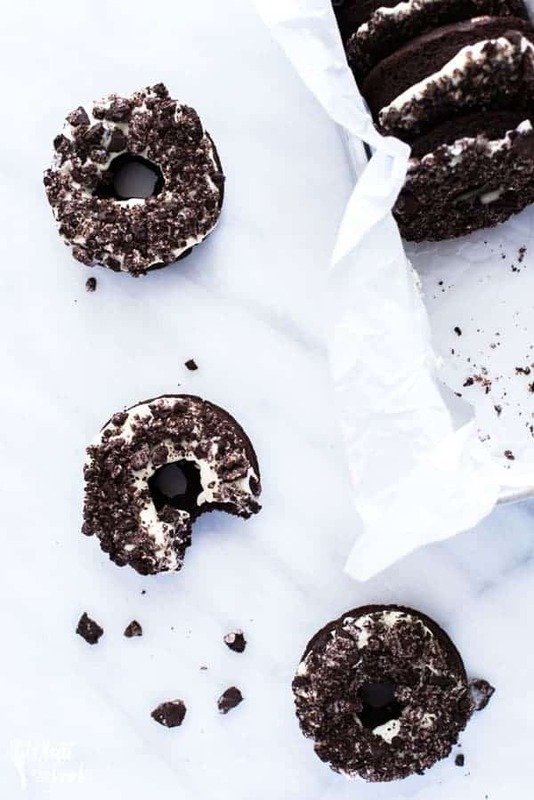 Gluten Free Cookies and Cream Donuts are a baked chocolate donut with cream cheese icing and topped with crushed chocolate sandwich cookies. They’re super easy to make and there’s even a dairy free option! 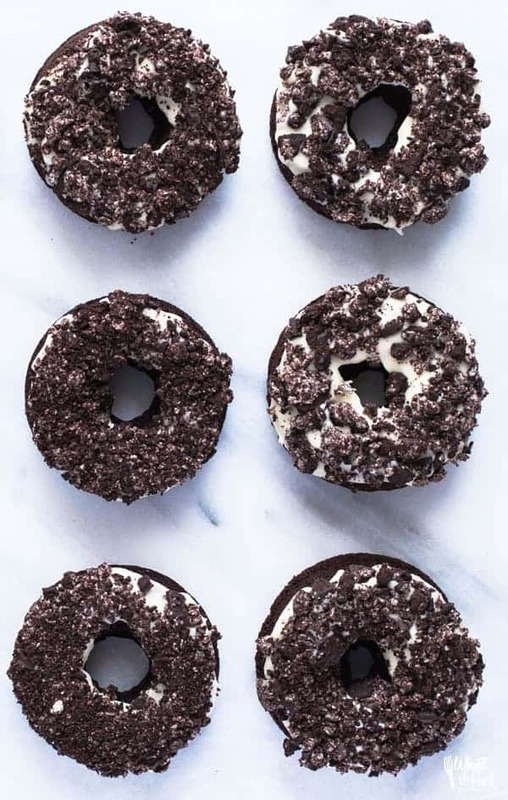 This recipe for gluten free cookies and cream donuts is basically just a baked Oreo donut recipe. The difference? Well, they’re gluten free and it’s really all in the name. 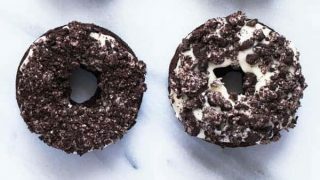 I asked on my Facebook page and my Instagram stories for everyone to vote on what they would call the donuts – Cookies and Cream Donuts or Oreo Donuts. The winner was Cookies and Cream Donuts by a landslide. Like, it wasn’t even close. 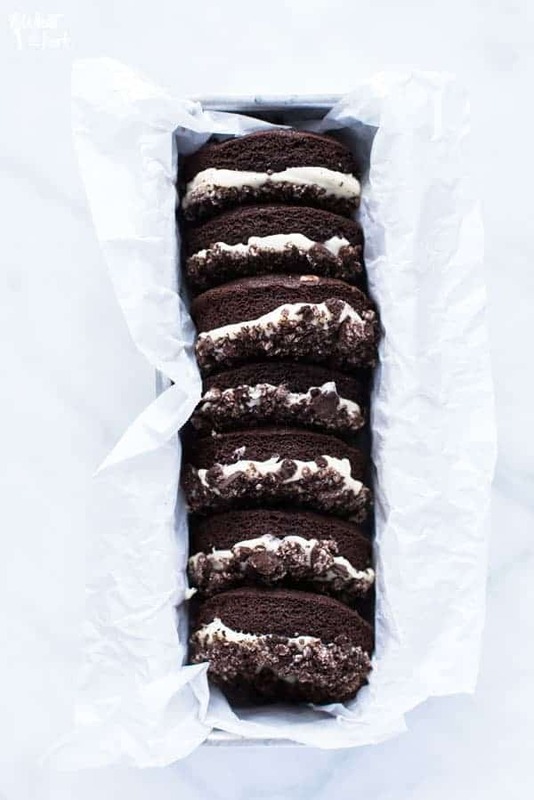 Regular Oreos aren’t gluten free so we just swapped them out for some gluten free chocolate sandwich cookies (I get ones that are dairy free too). I also stuck with my baked chocolate donut recipe base, it’s the same base recipe for my gluten free double chocolate donuts. 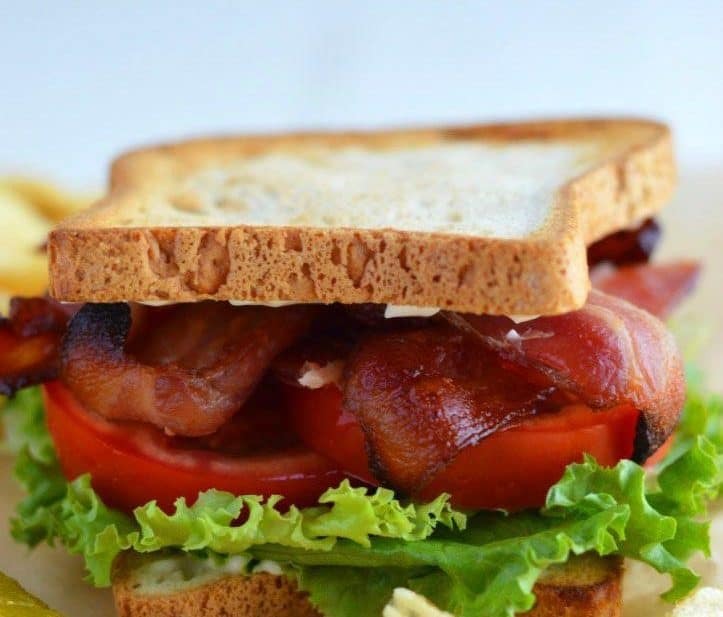 It’s a tried and true recipe and comes out great every time. I can’t remember if I shared this here before, but my very first job was at a local coffee shop. It was a small local chain, they had 5 stores. We sold all kinds of coffee, doughnuts, and pastries. One of the more popular doughnuts we sold was the Oreo Donut. At least I think it was Oreo. I can’t for the life of me remember if it was Oreo or Cookies and Cream. But I DO know that it was a fried yeast based donut (doughnut) frosted with vanilla frosting and topped with crushed Oreos. So many crushed Oreos, they were loaded with crumbs like these ones! Don’t skimp on the topping here! I changed mine up a bit and used my gluten free chocolate cake donut base instead of a fried yeast version. Honestly, I haven’t mastered that yet. Hopefully one day. Also, instead of a vanilla based frosting like we used at the coffee, shop, I added a bit of cream cheese. It’s a great contrast with the sweetness from the cookies. This frosting/icing is thicker than a glaze. It needed to be sturdy enough to hold all those cookie crumbs! 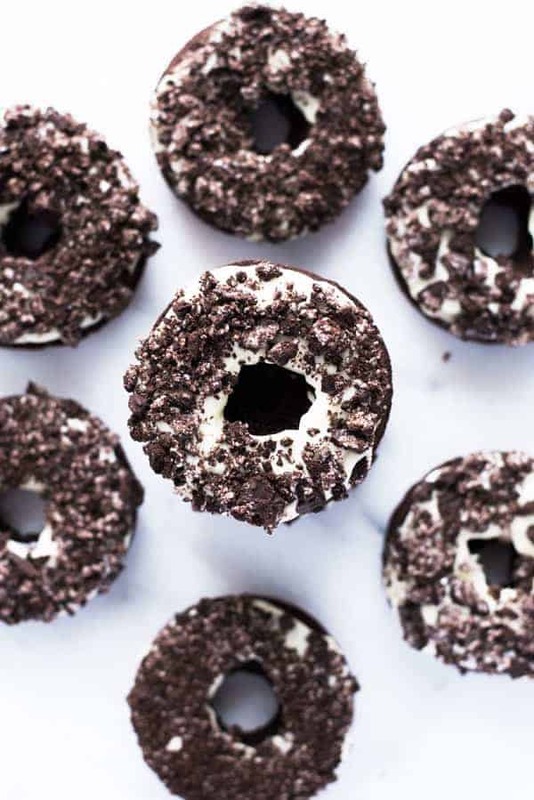 You guys are going to love this cookies and cream Oreo donut recipe. My youngest’s favorite food is donuts and she has officially declared these to be her favorite ever. Enjoy! 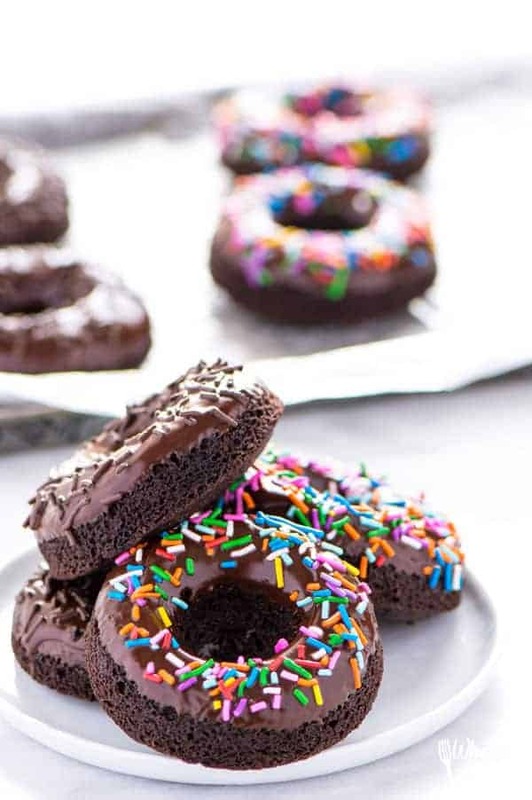 If you love these donuts, check out the cake version – Gluten Free Chocolate Cookies and Cream Cake! Gluten Free Cookies and Cream Donuts are a baked chocolate donut with cream cheese icing and topped with crushed chocolate sandwich cookies. They're super easy to make and there's even a dairy free option! Pre-heat oven to 350 degrees and spray donut pan with non-stick spray. In a large bowl, sift and mix together flour, xanthan gum, sugar, cocoa powder, baking powder, baking soda and salt. In a separate bowl, whisk together the milk, oil, egg, vanilla extract, and chocolate extract if using. Pour wet ingredients into the bowl of dry ingredients. Stir until just combined. Fold in 1/4 cup of the crushed chocolate sandwich cookies. Transfer batter into a ziplock back. Cut one corner and pipe batter into the prepared donut pan. You can also use a spoon to transfer batter to the pan but piping it from the ziplock bag is easier and neater. Bake donuts for 8-10 minutes. When done, the top of the donut will spring back when touched. Mine took 9 minutes. Cool donuts completely on a wire rack. Add the butter and cream cheese to a bowl and use a hand mixer or stand mixer to beat on low until combined and fluffy. Add the powdered sugar, vanilla extract, and heavy cream. Mix on medium until blended and is smooth and creamy. Add additional heavy cream to thin a bit if desired. Spread the icing on the cooled donuts then gently dip each donut in the remaining crushed cookie crumbs. Serve immediately or keep at room temperature or refrigerated up to 1 day. See notes for freezing. 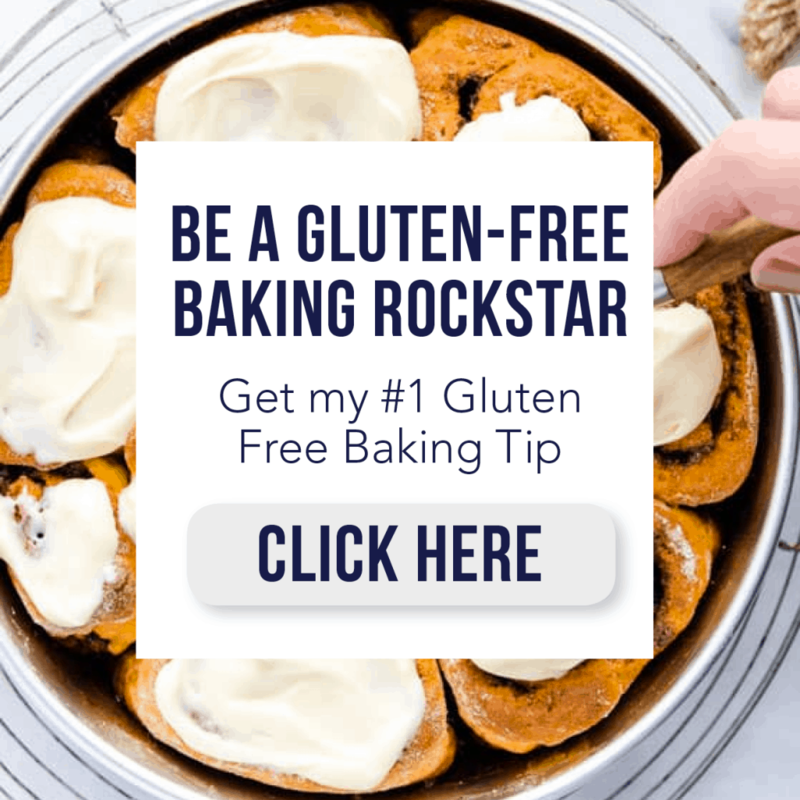 I use my Nightshade-Free Gluten Free Flour mix in this recipe. 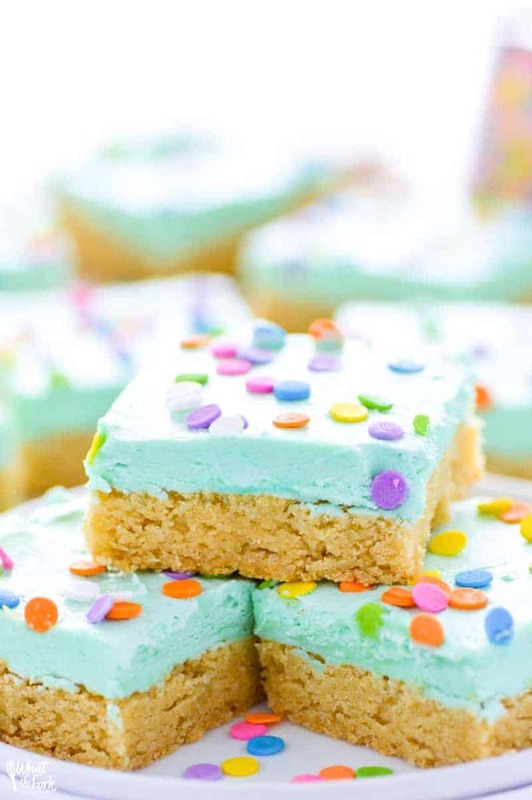 To make the icing dairy free, use 1 tablespoon vegan butter, 1 tablespoon palm shortening, 1 oz. dairy free cream cheese, and coconut milk as needed. If making the dairy free version, make sure your gluten free chocolate sandwich cookies are also dairy free. The frosted donuts can be frozen. Just defrost at room temperature before serving. I freeze them on a sheet pan before transferring them to a freezer bag. Thank you so much for the Gluten Free recipe! I can’t wait to try the Cookies & Crean Donuts. I have a reason to but a donut pan now lol. Bring a Celiac it gets hard to find good treats to eat. You’re welcome and I hope that you enjoy them! Let me know how they come out for you- enjoy!